I believe these were made in 1972 , there is a number 72 scratched into the ceramic under the glaze on the bottom. 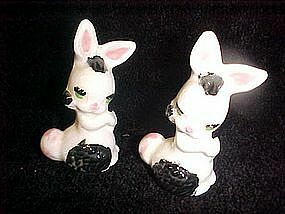 These cute little fellas measure just over 3" tall and are black and white spotted. Perfect condition. Would be adorable for Easter decor.